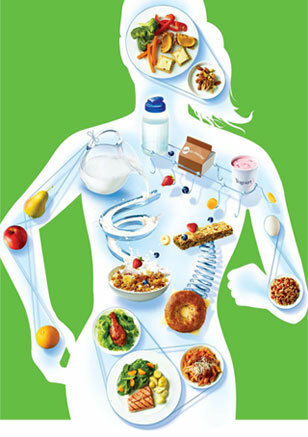 Now-a-days people are more conscious about their body and fitness a perfect nutrition is the secret key behind this. So in this fitness freak world you have to take care of your health by providing healthy supplements and best quality foods that fulfill your daily nutrition requirements of your body. Proper intake of food keeps you healthy giving you a disease free atmosphere. As an engine needs fuel, our body also needs food for proper growth and stamina. Intake of proper food and a healthy diet makes you feel alive. Scientists have found out that improper diet which lacks proper nutrition might be the main cause of cancer and heart disease. So to consume good health good nutritional elements are required to fight illness and diseases. We need to take different types of food by balancing a proper diet chart. We may add more fruits and vegetables to our diet chat that has much health beneficial nutritional properties. 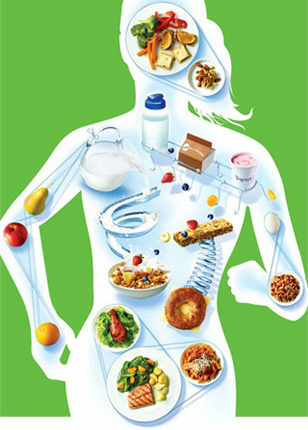 The daily requirements for the body include five substances that are carbohydrates, fats, minerals, vitamins and water. We need these essential compounds in a proper amount daily for perfect nutrition. Each of these elements is essential for different functioning but we should not exceed the level of intake of these foods because some of them have harmful effects if eaten in large amount. Basic thing that our body requires is carbohydrate which is of two types; one is simple and another is complex. Carbohydrate which is present in sugar, rice, bread and potatoes are complex Sugar intake should be less than other foods. So carbohydrate is the essential compound for energy requirement of the body. Proteins are required for proper growth and functioning of cells, tissues and muscles. We can give protein to our body by eating dietary products, eggs, meat and fish. Vitamins are also most required for the body that fights many diseases by enhancing proper immune system. It keeps nervous system well balanced. Minerals are required for the body for proper functioning of many vital organs, these also protects from many diseases. Minerals and vitamins which are largely present in fruits and vegetables. So we should eat more fruits and vegetables for a nutritional diet. These also make you more beautiful with sparkling skin and shiny hair. Weight conscious people think that fats are bad for health but our body requires some amount of fat daily but it should not be taken in a large amount. Unsaturated fats are good for health. Fats are found in dietary products, oily food, cakes and biscuits. Lastly what we require for proper body and health is water because our body contains large amount of water nearly about seventy percent. Drinking water in a large amount has many good effects. Water transfers nutrients, oxygen and it also helps for digestion. So these are the basic nutrition requirements by the body. Before preparing a diet chart keep all these things in mind and then go for it. For daily physical activity and workouts eat different food with proper glycogen content. We should also eat food with fiber contents. So in this busy world proper health care should be taken care of with eating of proper nutritious food. I agree with the author’s point of view: to maintain regular water is good for your body,Drinking water in a large amount has many good effects. Water transfers nutrients, oxygen and it also helps for digestion. I think the Daily Body Nutrition Requirements important point is: eat eat breakfast, eat in a good dinner to eat less, try not to eat supper. While you are bodybuilding and exercising, oxidative free-radical damage occurs inside the body, according to the Pumping Station. Because of their rich antioxidant properties, it is recommended that vitamin C and E supplements are taken. Antioxidants protect the molecules in your body from free-radical damage, toxins and pollutants. Vitamin C is important as it helps the structural components of the blood vessels, bone tissue, tendons and ligaments. We certainly are what we eat. Finding fresh fruits and vegetables with sufficient nutrients can, however, be a challenge. Some kind of supplements are therefore required. One of the best providers I’ve come across is Paradise Nutrients. Reputation means everything The internet is an open forum that allows anyone to make comments about professionals and practices – regardless if it is true or not. Negative content from online articles, blogs, and inaccurate reviews can appear almost instantaneously. Many may not even realize that they have a problem and once content gets online, it can almost never be deleted. Protect yourself and let us drive down negative search content. if we will take a healthy diet it will not only make us to look young and fresh but also make us physically and mentally strong.